Die Co. manufactures cage nuts in more than 100 standard sizes – the largest cage nut line in the industry. Die Co. cage nuts are the perfect combination of spring steel fastener (cage) and multi-threaded nut, providing a powerful attachment. Before installing the mating bolt, cage nuts hold in place, withstanding assembly line vibrations. As the bolt is tightened, the cage keeps the nut from turning, enabling standard proof loads. Thanks to extra space between the nut and cage, cage nuts can accommodate slight misalignments. Installing or removing cage nuts requires no special tools. They are ideal for blind assemblies. 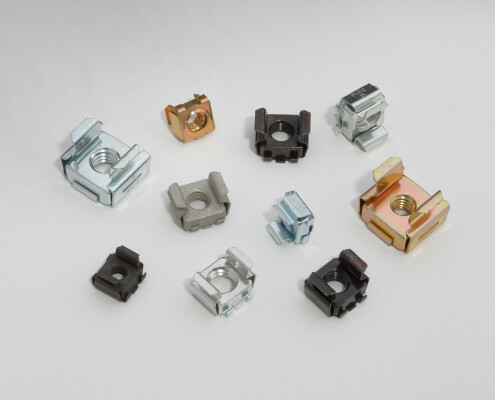 Browse the selection of Die Co. cage nuts in our product catalog, contact us to customize a cage nut for your application or check for a competitor part on our cross reference list. Die Co. provides cage nuts in more than 100 standard sizes – the largest cage nut line in the industry. Learn more about Die Co. cage nuts and find part numbers in our product catalog or check for a competitor part on our cross reference list. Email a Die Co. representative – or call 440-942-8856 – and tell us what you need. One of our fastener experts can help you find or design the best cage nut for your application.